The Keystone XL pipeline has been delayed. Activists in MI threaten to cut off of Line 5. And the price of tar sands oil has dropped to less than $14 a barrel because the existing pipelines are full. These factors are creating huge pressures on Canadian pipeline infrastructure giant Enbridge to develop more pipeline capacity to get oil from Alberta tar sands to the Gulf and out for export. The most likely route for all this dirty oil is through Minnesota, Wisconsin and Illinois on south. We anticipate Enbridge announcements soon. Many landowners, who previously negotiated an agreement with Enbridge for the existing Line 61, will be asked for an additional easement to build another pipeline, dubbed a 'twin' in Enbridge documents. Some may welcome the payment that comes with negotiating this easement. Others may not. Enbridge, a foreign private company, may be granted eminent domain rights to take the property of those who fail to come to an agreement. 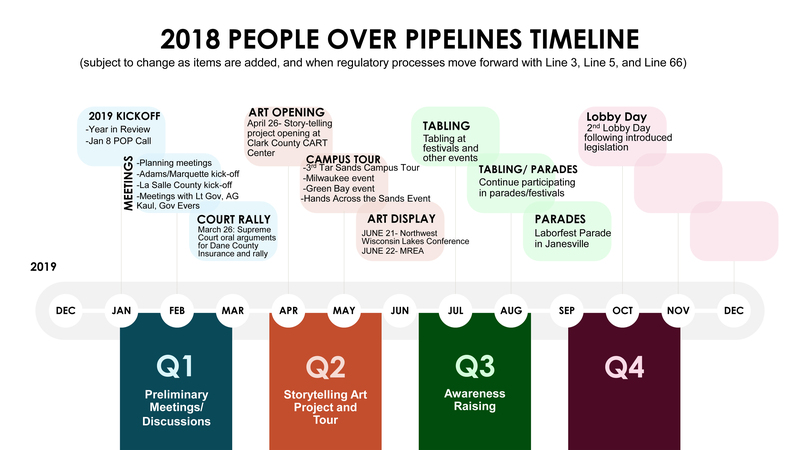 SOIL is the ONLY organization working with landowners and community members in the counties where the pipeline will go to help them organize to resist the pipeline. We need donations to enable us to keep our very effective organizer working in Illinois. Thanks in advance for your contribution to this cause that means so much to all of us. The SOIL Team just gave a presentation to Chicago Area Peace Action’s climate team. You can download the presentation deck here. Our allies on the Wisconsin Safe Energy team have created a 2018 summary of actions taken up and down the Line 61 in WI and IL. You can download the full report here. As part of the conditional approval Enbridge received for the Line 3 Replacement pipeline, it was required to estimate the cost of a “worst case” spill, such as into the Mississippi River. The greatest portion of the total $1.4 billion cost would result from efforts to clean up environmental damage. This $1.4 billion estimate is based on 13 minutes of spill. The 2010 Kalamazoo, MI spill went on for 17 hours before it was stopped. Businesses located near a pipeline break would also incur sizable costs. You can read more in the Duluth News Tribune and the Minneapolis Star Tribune. The Minnesota Public Utilities Commission has concluded that Enbridge’s “policies do not cover damages from crude oil spills to any significant degree, if at all.” These kinds of policies carry at the top line a blanket exception and exclusion for all pollution damages, and are not the kind of policy that we can rely upon to protect the people and taxpayers. You can read more in the Minneapolis Star Tribune, Wisconsin Public Radio and the Milwaukee Journal Sentinel. 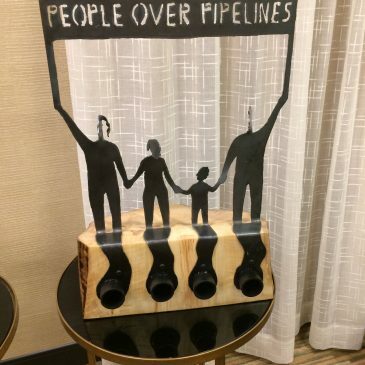 by Jennifer Thompson Several SOIL members recently attended a pipeline summit in Marshfield, WI. We learned a great deal, made new friends and alliances in the pipeline fight, and came away feeling hopeful that we will be able to stop the next pipeline proposal!